Physics-engine based bike game: get from start to finish as quickly as possible without crashing and get your time gauged with the three star system. You’ve probably seen it all before, so what more does this game offer? Immediately you notice how slick the display is; the screen zooms out gradually as you go faster, giving you a fighting chance of reacting to a ramp, edge or pile of rocks before the otherwise inevitable explosion of bike parts. Of course, the system isn’t infallible, but you can be sure that the vast majority of levels will feel fair and can be done without any trial and error. To help the cause, the developers place Slow Down signs with varying degrees of urgency which you’ll do best to follow as accurately as possible lest you suffer an untimely demise. Surprisingly, there is a good deal of variety through all the levels, and you need not be wary of simple A to B stages across a bumpy plain again and again and again. Some will test your patience as you race against the clock, requiring some careful timing and use of brakes while others will examine your reactions as you anticipate the terrain at breakneck speed. 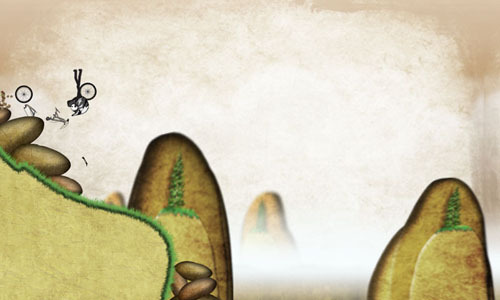 With 70 reasonably long levels, gradually rising in difficulty, the game should keep you busy for a fair amount of time. As you may expect, completing levels gives you access to a range of bikes, which not only vary in looks and speeds but also provide some options for emphasis in robustness, handling, braking and weight to match your own style. The game does require you to Like on Facebook to unlock certain bikes, but even without those ones, there are plenty to choose between. 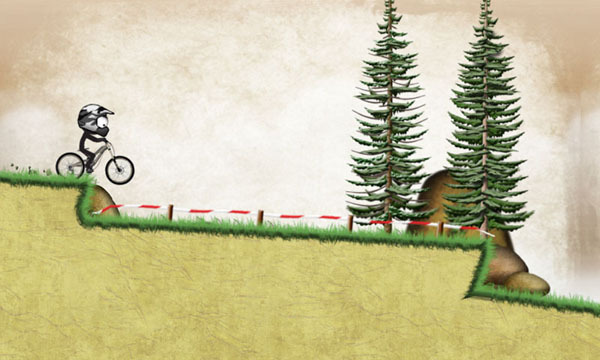 In contrast to what you may expect from a game called Stickman Downhill, there’s a satisfying range of well-designed and attractive settings which offer not just a change in background image, but also subtle differences in the styles of track. Fortunately, while there are full-screen ads, they are infrequent and fairly unobtrusive, only appearing while the game is loading and without the risk of you touching them accidentally and triggering a web page to open. 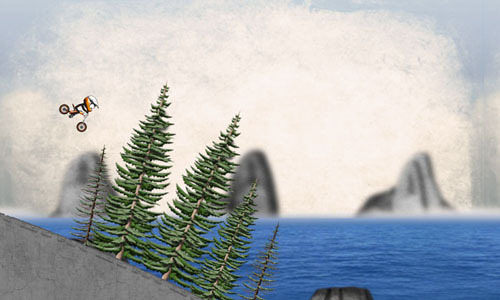 Considering the enjoyment factor, replay value and technical strength, Stickman Downhill is among the best in its genre and is worth a try even if you’ve been frustrated by other games in a similar vein. it make me tought of old olympic and sport games on Atari! AndroidGamesReview.com is out to find the Best Android Racing Games and the Best Free Android Games for you to play on your phone. Visit us regularly to see our reviews of the latest indie games for Samsung, HTC, Nexus and other Android phones. If you ever get stuck with a game, then feel free to leave us a message or check out our game hints and tips. You can install apps from Google Play by scanning the QR code or clicking on the image link in the review page.